I’m writing this on March 21st, the first day of spring, waiting for the third nor’easter that’s supposed to pummel us AGAIN. As I look out the window, I see the Post Office across the street. Since we have a new database, General Reference Center Gold, I thought I would try a search and see how easy it is to use and what kind of information it returned. Hmm, what kind of use does the Post Office have nowadays? The second news article that comes up is from last September, from The States News Service, informing me that there were 2.7 billion visits to all post offices in the U.S. in 2016. I then did the same search in Google and the first hit is from something called savethepostoffice.com from 2011. I admit I only skimmed the article, but I couldn’t find a quick answer – and how relevant is 2011, anyway? My point in writing this is that the library is a reliable source of information, whether you come in to ask us something, or to search yourself, or to search from home through online access. There’s a popular meme that says ‘Google will find you 100 answers, a librarian will find you the RIGHT one.’ Every day, though, we all face people who say libraries are irrelevant and unnecessary in this age of Google, so I call on all of you who don’t believe that to share your positive library experiences far and wide. Of course, if you are reading this, I know you don’t agree and many of you already told us as much in the survey (thank you for taking the time to fill it out!). We will be getting back to you with the results once we have a chance to analyze them. We are so appreciative of all the comments and hope to implement what we can from all the suggestions. Another way to show your support (and it’s fun, too!) 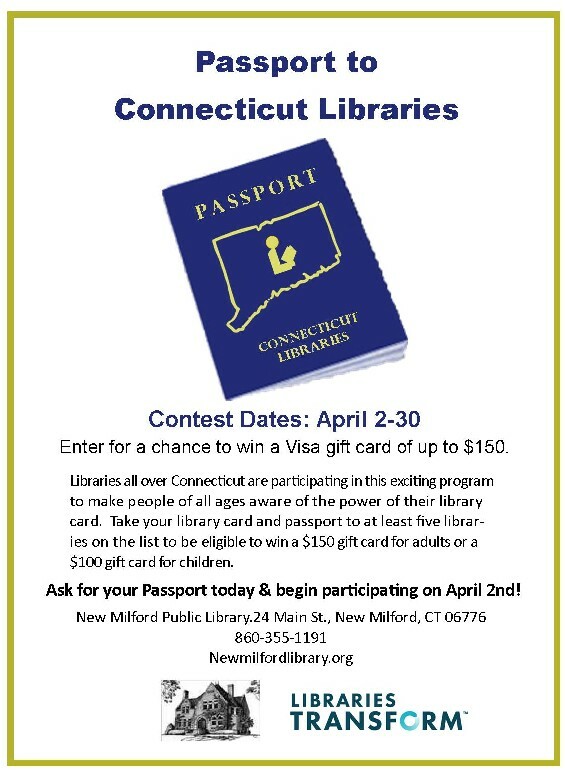 is to participate in the statewide program, Passport To CT Libraries, during the month of April (see flyer below). All you have to do is pick up a passport at NMPL (and we’ll give you a small gift! ), visit at least five other participating libraries during the month with your library card, then submit your passport to NMPL for entry into the raffles to win a statewide prize for Most Libraries Visited or General Raffle. There are four prizes, 2 each for adults and for children. The prizes are $150.00 gift cards for adults and $100.00 gift cards for children. So sign up the whole family! 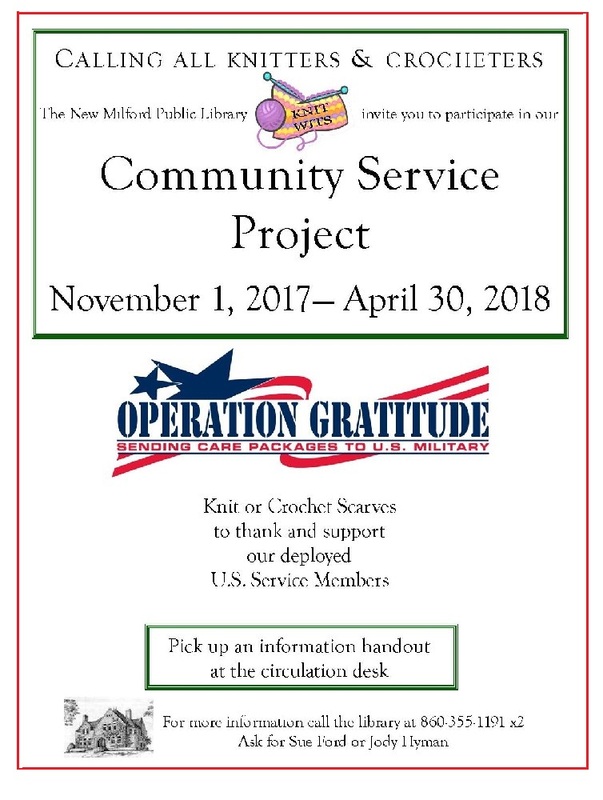 Only 1 more month to get your scarves done for NMPL’s Knit Wits group Community Service Project. So far, we have received a generous donation of beautiful projects. So we thank all of our wonderful patrons for your caring efforts. Thank you! We are switching things up with our databases. We have offered Ebsco’s Masterfile Premier and Small Business Reference Center for years as a basic research tool and a small business aid, but we are now going to switch to Gale’s General Reference Center Gold and Small Business Builder. Our reason for changing is that the Gale offerings are much more user friendly and patron specific. General Reference Center Gold is primarily a resource for general research, containing 102,579,592 articles, updated as recently as March 16, 2018. The database provides for either a SUBJECT GUIDE SEARCH or a PUBLICATION SEARCH. You can use the TOPIC FINDER option to discover the context of your search term and uncover hidden connections. It is accessible from home and is an authoritative resource for any research. Take a look next time you need information on any topic! Small Business Builder is an invaluable resource for small business owners and nonprofits, offering templates for any number of situations and guided paths for whatever plan you have. Who can benefit from Small Business Builder? Explore your interests and determine your best opportunities. Take your business idea and walk it through the steps necessary for getting it funded. Eighty percent of small businesses make it through their first year, but only 55 percent make it to five. Get the planning resources you need to join the long-term successes. Learn the elements you need to know to write bylaws, secure funding, and build your organization. You know your business best. Choose the activities most relevant to you. Go deeper with activities and resources that build your business acumen. Need to print or email a document or send a fax? We have you covered! Up to now, however, if your document was several pages long, it was a laborious process and a real nuisance to scan one page at a time. 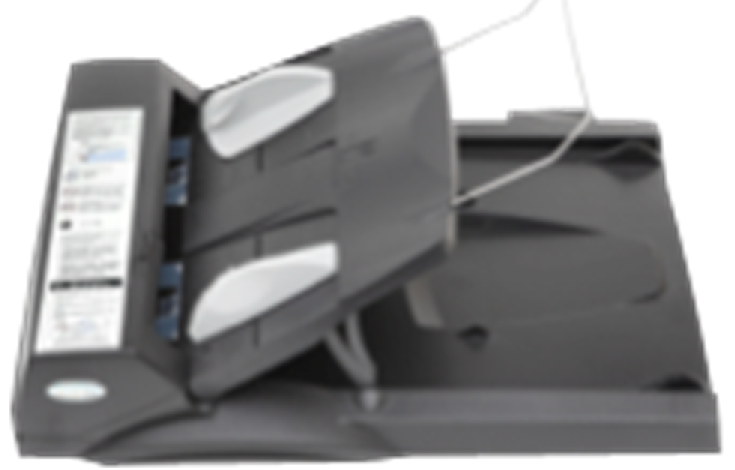 Now we have added a document feeder to our LDS system which allows you to insert your stack of papers and scan them all at the touch of a button! Don’t forget, scanning and emailing is free, but faxes cost $1 per page, which must be paid in cash to the Reference Librarian prior to faxing or can be paid at the Main Desk with a debit or credit card. The memories and treasures of individuals, families, and communities are essential to our understanding of history and its participants. 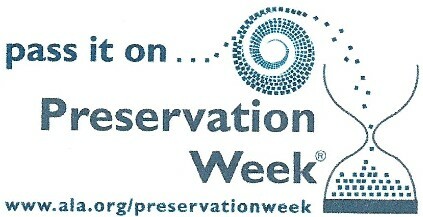 During Preservation Week, themed “Pass it on,” April 24 – 30, 2018 the New Milford Public Library will join hundreds of libraries, archives and museums from across the country in observance. The Importance of Preservation Awareness- Some 630 million items in collecting institutions require immediate attention and care. Eighty percent of these institutions has no paid staff assigned responsibility for collections care; 22 percent have no collections care personnel at all. Some 2.6 billion items are not protected by an emergency plan. As natural disasters of recent years have taught us, these resources are in jeopardy should disaster strike. Personal, family, and community collections are equally at risk. No longer just a place for books, the New Milford Public Library is also an excellent resource for high-quality information and programs. Monday April 23rd at 2 PM our Technical Services department will present “Book Care and Simple Repair”. Join us in Memorial Hall as we share tips. Monday April 30th at 6:30 PM we will play host to the New Milford Trust for Historical Preservation. President Robert Burkhart presents “Preserving the Past for the Future”. We invite you to join us to participate in our efforts to preserve our community’s rich history. Meet One of NMPL’s Fabulous FRIENDS: Mikki Harkin! If you or your kids have attended a school or acted in a play in New Milford, you probably know the inimitable Miss Mikki! And for the past two years, she has focused some of her infectious energies on managing the Social Media for the FRIENDS of NMPL! Mikki was born in New City, NY, the oldest of three. Her parents still live in the same house across the street from the school that Mikki and her younger sister Allyson and younger brother Chris attended. 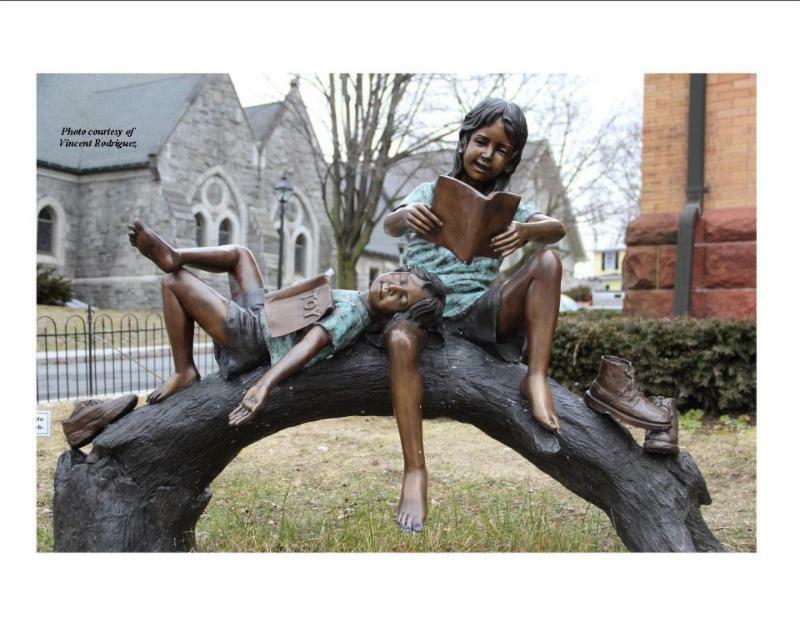 Mikki said her mom insisted that kids should be either outside playing or inside reading. Today, Allyson and her husband live in New Jersey with two kids, and Chris is a stuntman for the “Fast & Furious Live” show touring in Europe. Mikki studied Occupational Therapy at Quinnipiac, while her high school sweetheart, and future husband, Tim, studied Civil Engineering at Cooper Union. After graduating, the newly married couple moved to Glen Rock, NJ, so that Tim could commute to the city easily. There, the couple added three more to their family, Tess, Tony, and RJ. When Tim switched jobs in 2004, the family moved to New Milford. Mikki stayed home the first year with the kids. In the fall of 2005, RJ started preschool and Mikki went to work in the New Milford Public Schools-and she has worked in our schools ever since! Mikki has always loved the theater and acting. Her love of theater has been handed down to her children; both Tess and Tony were in commercials when they were younger. In fact, her family was featured on TLC’s “A Baby Story” when RJ was a newborn. Her children have all studied theater at TheatreWorks and FineLine. Today, Tess is a junior at American University, and Tony is a freshman at WestConn. Tony is starring in “Peter and the Starcatchers.” And RJ is a freshman at NMHS and starring in “Curtains.” Tickets are still available! Besides acting, Mikki loves to travel. 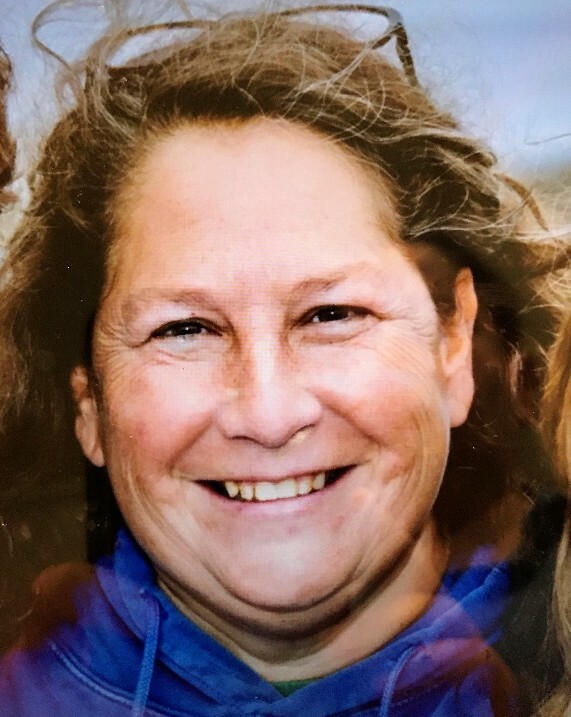 To celebrate her 50th birthday, she flew to London on her own. She toured as many sites as she could in her four days there-but she still had time to stop into a library in Stratford-upon-Avon, Shakespeare’s birthplace. Mikki’s lifelong love of reading has led her to helping the FRIENDS group and the NMPL. She has redesigned the FRIENDS’ website (http://friendsnmpl.org) and she has advocated for the library modernization. Her philosophy is God never gives you more than you can handle. It’s that kind of positivity that Miss Mikki shows her students and everyone around her.